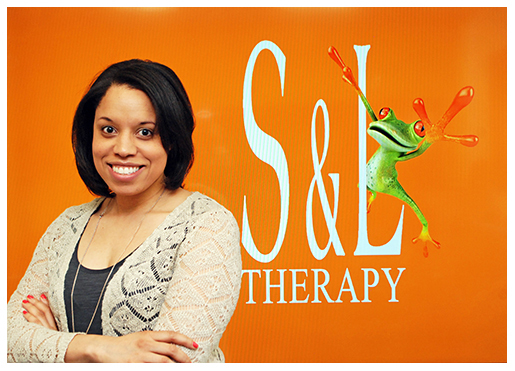 Jasmine Urquhart, Clinic Director - Boston Speech Language Therapy in Brookline, MA 02445. Jasmine Urquhart, M.S., CCC-SLP, BCBA is the executive director and chief clinician at S&L Therapy. She holds a Master’s Degree in Speech-Language Pathology and a Bachelor’s Degree in Communication Disorders, both from Boston University. Currently, she is working towards her doctorate at MGH Institute of Health Professions, with a research focus of defining measurable and objectifiable progress within pediatric speech and language therapy. Licensed by the State of Massachusetts and certified by the American Speech-Language and Hearing Association (ASHA), she specializes in the speech and language disorders of young children ranging from early childhood through the middle school years. Jasmine is also a Board Certified Behavior Analyst (BCBA) who focuses on the use of Verbal Behavior (VB) strategies for non-verbal children diagnosed on the Autism Spectrum. Her previous clinical experience with children is quite diverse and includes work in several settings: hospitals, public and private schools, and private practice. Prior to becoming a speech-language pathologist, Jasmine developed a passion for working with young children as a certified preschool teacher. She has over 15 years of experience working with children in the Greater Boston Area. In addition to managing S&L Therapy’s clinic, Jasmine is invested in education and the training of speech-language pathologists, educators, and other healthcare professionals. She has given several lectures and presentations on various aspects and topics in the field of speech-language pathology to many schools and organizations, most notably for Boston University, Emerson College, and ASHA. Jasmine has also presented at the Association for Behavior Analysis International (ABAI) convention. Since founding S&L Therapy, Jasmine has mentored and taught nearly two dozen graduate students, and trained just under a dozen clinical fellows. Jasmine’s pioneering commitment and passion to pediatric speech and language therapy is evident through her continued pledge to help drive advancements in the field. Jasmine is a principal and sits on the board of Ai-SLP, a non for profit organization founded with the mission of advancing the use of technology for speech and language therapy. She was the first speech therapist to use the iPad in speech therapy (prior to it being publicly released), she was also the first (and still one of the only) to use Google Glass as a therapeutic tool; and she was even one of the first to use the Xbox Kinect as a therapeutic tool for speech therapy. She helped design and fund the development of a first-of-its kind software platform that provides speech therapists with a software toolset to continually review, modify, and adjust therapeutic goals and objectives in ways that drive more efficient therapy that previously was unattainable. In addition, she helped sponsor www.aslforslps.com, a website committed to being a repository for sign language (as applied to pediatric speech therapy) and research for how to best use signs with pediatric speech and language therapy. She is currently working to help ASLforSLPs build and film a series of workshops that provide therapists with a better understanding and foundation for the use of signs in pediatric speech and language therapy. In total, Jasmine is currently involved in over a dozen projects that are actively seeking to progress the field of pediatric speech-language pathology.